So this may possibly be the last baking post you see from me throughout Blogmas, however I may possibly make some mince pies in the week up to Christmas and I'll share these with you if I do! I'm just not in the mood for baking at the moment. I think because I bake so much over the Christmas period every single year I just want a break this year. I did need to make these gingerbread muffins though because they're just so cute with the cute little gingerbread men on top, I didn't want them going to waste! I really hope you love this post, and I'd love to see your creations if you recreate them! I feel gingerbread is the perfect thing to bake around Christmas because of how wonderful your house smells afterwards. 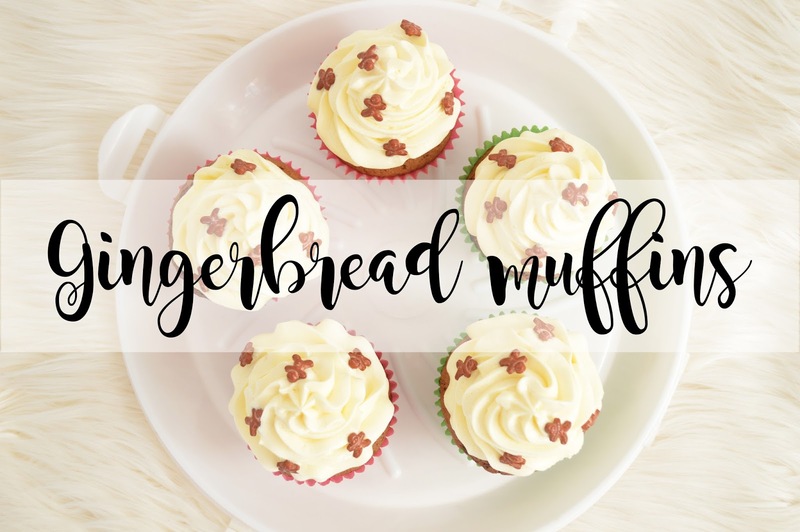 You can create gingerbread everything, from houses to cookies to massive cakes or even a loaf; they're so easy and everyone loves them really! (Unless you're my brother or my boyfriend). Heat your oven to 200 degrees celcius and place in your muffin cases into the tin. In a large bowl mix the brown sugar, molasses, milk, oil and egg. Stir in the remaining ingredients until everything is mixed together. Remove from the pan and place onto a cooling rack to cool completely. While waiting for the muffins to cool you can start making your icing! Simply place both of the ingredients into your mixing bowl and mix using a stand mixer or electric whisk until light and fluffy (where the icing can also hold). Use any piping tip you want and pipe the icing onto your muffins, this is all up to you now on how you want the muffins to look overall! I then sprinkled these with cute little gingerbread men! Let me know if you make these and if you do I'd love to see pictures! I think I need to make these for our Christmas Eve party...they look so cute. Gingerbread is one of my favourite Christmas smells :) Great post. Holy moly those look good! Thank you for the recipe! great post, love a good old recipe that is Christmas themed!